Samaritan's Purse is developing creative ways for the poor in the Philippines to generate income. After Typhoon Haiyan destroyed or damaged 1.1 million homes, shelter quickly became one of the greatest needs in the Philippines. Samaritan’s Purse responded immediately to the devastating storm by providing shelter kits and shelter plastic to thousands of households. But with more than 4.2 million people displaced, the needs were greater than shelter. Along with their homes, many families also lost their livelihoods. Samaritan’s Purse is helping families rebuild their lives by teaching them new skills through our livelihood projects. Florencis Valenzona, 56, recently participated in a Samaritan’s Purse program that transformed him from a fisherman into a furniture maker. Before Typhoon Haiyan, Florencis lived on the coast and earned his living fishing. After the storm his family relocated inland to a transitional housing site and Florencis couldn’t fish anymore. With his source of income gone, Florencis didn’t know how to provide for his family. 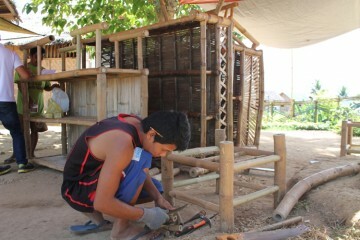 But through the livelihood program held at his transitional housing site, Florencis learned to make bamboo furniture including tables, chairs, and bed frames. Now he sells his furniture to earn money and support his family. “Thank you for giving me the opportunity to start again,” Florencis said. Livelihood Coordinator Jophil Pedrita explained that before the typhoon most program participants were fishermen, taxi drivers, or shop owners who earned money day-by-day. It’s challenging for them to change that mindset. “We keep encouraging them that if you keep at it, you will see results,” Jophil said. Men at another transitional housing site are farmers who are used to growing vegetables and selling their crops at roadside stands. Most vegetables in the area are now imported from southern islands in the Philippines, making it hard for them to earn a consistent wage. Samaritan’s Purse is teaching the farmers to plant and harvest bamboo, which they can then sell to men like Florencis to use for their furniture making. 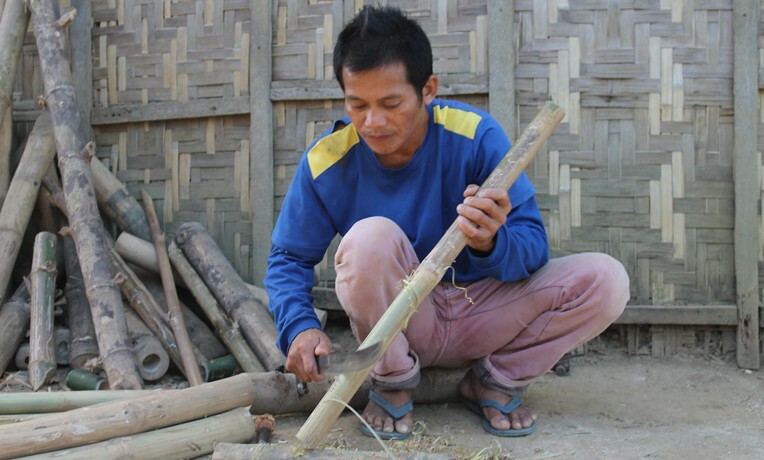 Farmers in the livelihood program are planting four different bamboo varieties. So far they’ve planted more than five acres with plans to plant 15 more. The livelihood program is not only teaching farmers how to plant bamboo, but also how to maintain the crop and eventually reap a harvest. They are learning to be patient and diligent in their work because they won’t see their first harvest for another two or three years. Our programs are helping Filipinos earn a decent living. Samaritan’s Purse also is teaching men in the programs how to save money for the future. “It’s something new for them—it’s a big deal for them to make money that will last more than one day,” Jophil said. As more and more people move from transitional housing sites to permanent housing, the market for bamboo furniture will continue to increase. 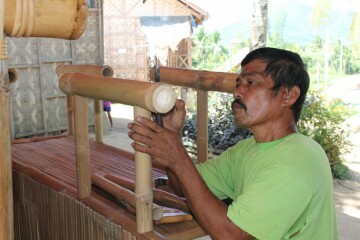 Learning new skills like harvesting bamboo and making bamboo furniture is giving Filipinos a chance to start again. It’s a chance to begin rebuilding their lives after the storm. Please continue to pray for the people of the Philippines as they recover from the destruction of Typhoon Haiyan. Livelihoods By improving farming techniques, increasing the productivity of livestock, opening up access to markets, and providing training in basic business skills, we help households and communities make the transition from subsistence living to income generation, securing a better future.